I recently revisited Wheaton Village at Millville, NJ. 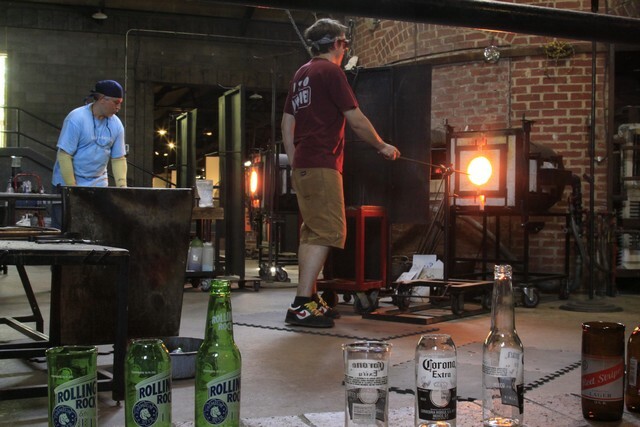 This non-profit museum and artisan workplace which preserves the heritage of traditional glassmaking was created by Frank H. Wheaton, Jr. in 1968. He was the grandson of Thomas Wheaton, MD, who started in the glass business in the mid 1880s, a business that became the T.C. Wheaton Company in 1890 and which, although owned by a Swiss firm, survives as Wheaton Industries. The village has struggled to survive but it continues. There’s a broad main avenue with Victorian era buildings on either side, shops and an outstanding glass museum. 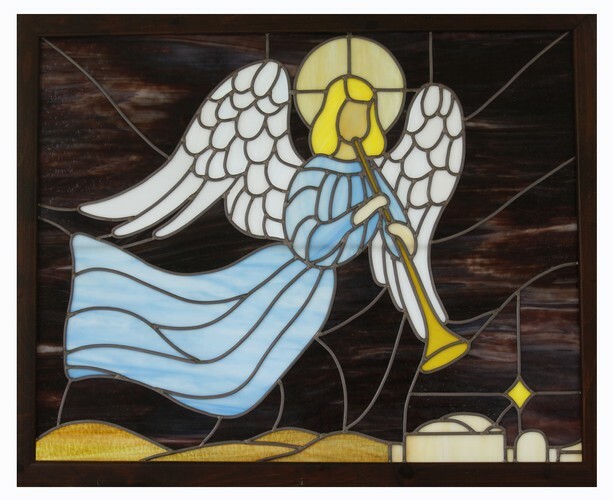 The shops contain a wide array of beautiful, striking art and functional glass pieces, many made by village artisans. They have on occasion held an international show which draws artists and buyers from all over the world. A $50,000 price tag on a glass sculpture is not unusual. Behind the museum there’s a glass blowing building where someone’s usually at work as above. This man was converting beer bottles into tumblers while retaining the labels. Although this product is prosaic I’ve also seen some “wow” pieces created here, particularly during the international show. One that I recall was a silvered hand. Below is a shot of him working one of the heated bottles. They’re famous for their paper weights, one of which is below, left, called a Millville Rose. One can make their own paper weight by appointment which I did a few years ago. 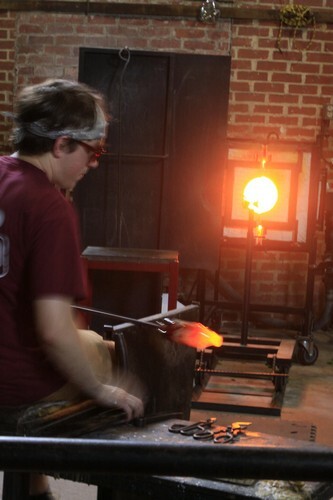 You actually work in front of one of the above kilns but they have an expert right at your elbow. On the right is a window in their magnificent glass museum which includes great displays on the history of glass, and all kinds of glasswork. 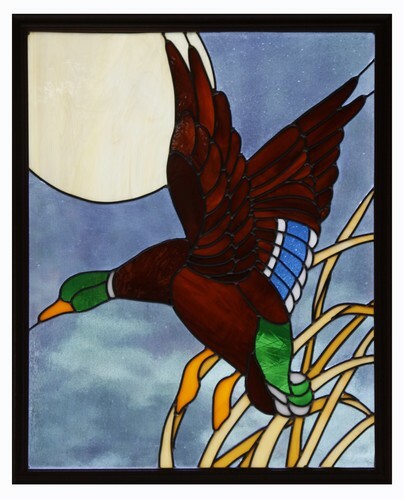 I’ve been a glass enthusiast for many years and I’ve done a lot of stained glass tschotkes. I’ve also done some larger panels, samples of which are below. The first was done from a pattern and measures 17″ x 21″. The feather detail was tedious but the effort was worth it. 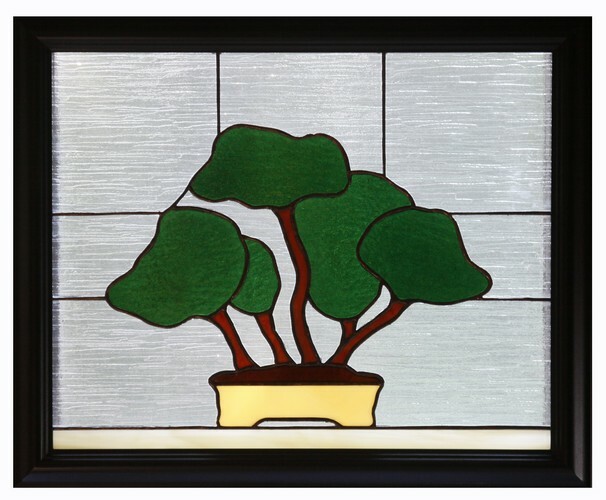 Below is my everlasting Bonsai plant which is an original 16′ x 20″ pattern. I made two; the original was for my friend, LeRoy, who cultivated real Bonsai, and then one for me because I liked its simplicity (a Bonsai attribute, after all). Finally, I was struck by a friend’s Christmas card one year so I created this pattern from the card. This piece is about 24″ x 30″. Were I a true 14th century glass artisan (or even a modern professional) I’d have given her facial features. Oh, well. A man of many talents!!!! Beautiful work Ralph, you should be proud!!!! Thank you, Kath. I’ve enjoyed it and I really like to look at them now and then.